Typically speaking, if I have more than two consecutive days off work, I'm on a plane and adding a stamp to my passport... but this year's Lunar New Year holiday was a little different. Why? Two words. Winter. Olympics. As you can imagine, finding accommodations in an Olympic city (during Lunar New Year) was a bit of a nightmare... (a nightmare only made worse by people's unwillingness to commit to solid plans). Knowing that I'd need to secure a place to stay well ahead of time (cause they weren't gonna get any cheaper), I went ahead and began the search for our Olympic holiday accommodations. I spent weeks scouring just about every booking site I could think of... browsing hostels, hotels, airbnbs, and guest houses in the Olympic cities of Pyeongchang and Gangneung. I even looked at options in the further, but cheaper, surrounding cities. Almost all of the accommodations I came across had one thing in common - they cost a lot for a little... all except one. Analog 76 could not have been a more perfect place to stay in Gangneung, home to the Winter Olympics Coastal Cluster. Not only was it extremely close to all the action at the ice venues... it was also extremely affordable. When it comes to affordability, the same cannot be said for most of Gangneung's surrounding hotels and guesthouses. By the time we booked, most places were either sold out or cost upwards of 200,000 won per night for a small motel room, or worse, a shared hostel dorm. We opted to splurge a bit on Analog 201 - The Industrial Loft, an incredible cozy space, located just a five minute drive from the ice venues, and a short walk or bike ride to Gyeongpo beach. Like the title suggests, we basically just crashed here. Unfortunately, we didn't even get checked in until 1am Friday night/Saturday morning. This was after a full day of Olympic games, house hopping, and more Molsons, Heinekens, and gin and tonics than I care to remember. Though we were busy bopping around the Olympics and didn't get to spend too much time here, we all agreed that Analog 76 would be an awesome place to spend a long weekend... and to actually hang out at. Analog 76 had literally everything you could need. A full kitchen, complete with an island counter top and two bar stools, a nice clean bathroom, two seriously comfy beds, a living room space, and additional seating and table space in the loft upstairs. Even though Todd was the only person who got in it, Analog 76 got massive bonus points for the jacuzzi bathtub. If I go back, you better believe I will be taking full advantage of that. Analog 76 had bicycles, which we borrowed to ride down to the beach on our last morning... And as if all that wasn't enough, the AirBnb hosts also gave us a ride back to the train station for free! For some reason, the location on the map was a bit off from the airbnb's actual location, so we left manyyy a cab driver quite befuddled in our search for it. Once we figured it out, finding Analog 76 was a breeze... but, unfortunately, none of us managed to hone in on our navigation skills until Sunday morning... just before heading back to Seoul. 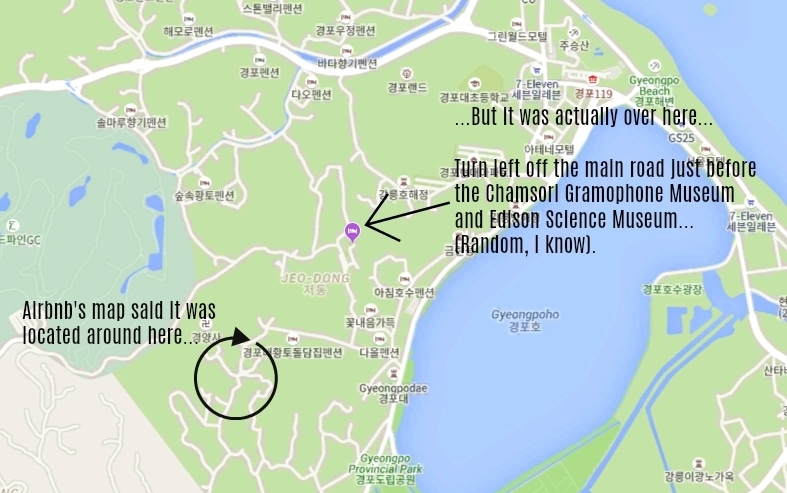 If you pass the (very random) Gramophone and Edison Science Museums on your left, then you've gone too far. You should take the left right before the museums and then take a quick right at the sign filled with signs... (you'll know it when you see it). Then take your first left... ride straight for a bit and then take a right down a massive hill. If you're in a car, proceed with caution... our first cabbie nearly lost the undercarriage of his car scraping over a big bump at the top of the hill... (we literally got stuck on top of it... and then all had to get out of the car while he got it unstuck)... anyway, Analog is down the hill and on the left. Despite our navigation hiccups, I absolutely loved staying here. Through they do have other units, with similar interior design and features, (based on the photos) I think A-201 was the best call for us. Ready to book your stay at Analog 76? First you'll need to sign up for airbnb. Sign up using my referral link for $40 in travel credit! To book A201 - The Industrial Loft - click here.